Joint subluxation and dislocation can be present at birth or occur later in life; can be inherited or acquired; can involve one joint or multiple joints; and can occur as an isolated anomaly or as part of a malformation syndrome or bone dysplasia. 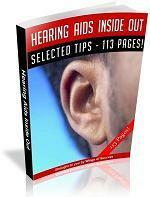 plasia have been addressed in specific sections in this book. Other single joint dislocations are briefly discussed in this chapter. 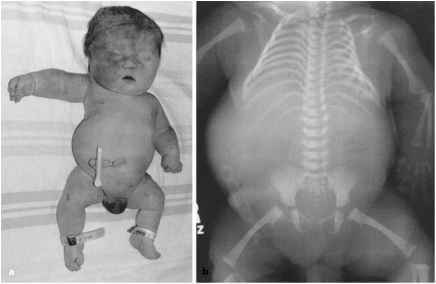 Congenital dislocation of the radial head is a well-recognized entity occurring either as an isolated anomaly (uni- or bilateral) or in association with other congenital abnormalities, particularly in the hands (Kelly 1981; Campbell et al. 1992) (Fig. 8.8). Both anterior and posterior dislocation are possible, either resulting in decreased elbow motion (Agnew and Davis 1993). Hypoplasia of the proximal end of the radius, a relatively short ulna, a defective trochlea, and prominence of the ulnar epicondyle are among the abnormalities that may be seen on radiograms. Dislocation of the radial head can occur as a component of any of several syndromes, including nail-patella syndrome (OMIM 161200), oto-palato-digital syndrome (OMIM 311300), Noonan syndrome (OMIM 163950), tarsal/carpal coalition syndrome (OMIM 186570), and ophthalmomandibu-lomelic dysplasia (OMIM 164900) (McKusick). It can also occur as part of auriculo-osteodysplasia (OMIM 109000), an autosomal dominant condition with characteristic ear shape (abnormal attachment of an elongated lobe, accompanied by a small, slightly posterior lobule), dysplasia of the radiocapitellar joint, and short stature. Hip dysplasia and abnormalities of the distal radius are inconstant features (Beals 1967). A special type of congenital radial head dislocation, posterior (OMIM 179200) has been observed in several members of the same family (Cockshott and Omololu 1958; Abbott 1892). An association with antecubital pterygium has been recognized (Shun-Shin 1954). Recessive inheritance is likely, with instances of male-to-male transmission (Reichenbach et al. 1995). Rotation at the elbow is more compromised than extension. Congenital dislocation of the knee is a very rare anomaly accounting for approximately an estimated 1 % of cases of congenital dislocation of the hip. Blacks are affected more frequently than whites, and females three times more frequently than males. Several causes have been proposed, including aberrant fetal position, breech delivery (Johnson et al. 1987), muscular imbalance (Jacobsen and Vopalecky 1985), and defective cruciate ligaments (Katz et al. 1967),but none has been substantiated. Genetic factors are certainly important, as also demonstrated by the occurrence of familial cases (Callahan et al. 1985; Collins et al. 1995). The anomaly consists in partial or total anterior dislocation of the tibia with respect to the femur, resulting in hyperextension with limited flexion capabilities of the knee, and valgus deformity. Shortening of the quadriceps femoris tendon, a tight anterior articular capsule, and hypoplasia of the suprapatellar bursa take place on a secondary basis (Ooishi et al. 1993). Anterior tibial bowing (genu recurvatum) and patellar hypo-plasia can also occur. Dislocation of the knee can be isolated or occur in association with other joint dislocations, spinal anomalies, and foot anomalies (Fer-nandez-Palazzi and Silva 1990). Congenital displacement of a single vertebral body can also occur. Acute dislocation, often after a trivial trauma, is accompanied by sudden onset of neurological deficits. In other cases, neurological abnormalities appear gradually and tend to worsen over time (Shapiro and Herring 1993). unique changes in the epiphyses (smallness, flattening, irregularity, fragmentation); in the metaphyses (widening, irregularity, sclerosis); in the hands (gracile metacarpals, long slender phalanges with squared ends, prominent phalangeal tufts, small and irregular carpal bones); and in the spine (posterior scalloping of the lumbar vertebral bodies, end-plate irregularity, craniocaudal narrowing of the inter-pediculate spaces) (Hall et al. 1998). On the other hand, spondyloepimetaphyseal dysplasia with joint laxity is associated with kyphoscoliosis at birth, talipes equinovarus, cleft palate, congenital heart disease, and a specific facial dysmorphism. 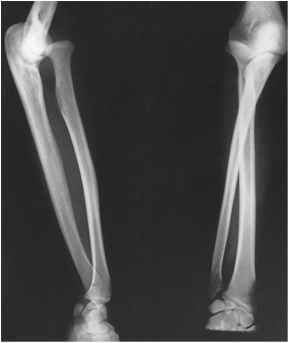 Multiple dislocations also occur with pseudodiastrophic dysplasia (OMIM 264180), a condition first described by Burgio et al. (1974). With few exceptions (Eteson et al. 1986), this is an early lethal disorder that shares similarities with,but is distinct from, diastrophic dysplasia (OMIM 222600). 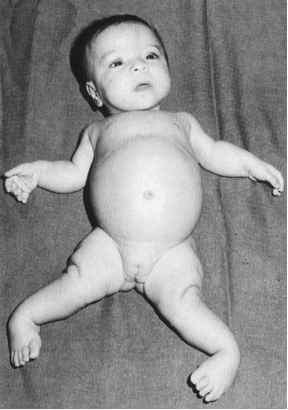 Rhizomelic shortening of the limbs, severe clubfoot deformity, and atlantoaxial instability are common to both conditions. Distinct features in pseudodiastrophic dysplasia include marked lumbar scoliosis, more severe platyspondyly, tongue-like deformities of the vertebral bodies in the lumbar spine, enlarged bitemporal diameter with midface hypoplasia, and a unique pattern in the hands, with multiple interphalangeal and metacar-pophalangeal joint dislocations and normal appearance of the 1st metacarpal, as opposed to the ovoid, hypermobile, abducted, proximally inserted (hitchhiker) thumb of diastrophic dysplasia. Cartilage histology at the growth plate is also different in dias-trophic dysplasia and pseudodiastrophic dysplasia. 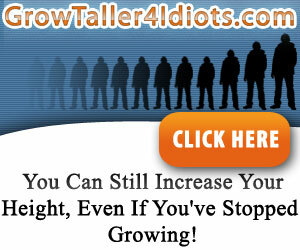 Moreover, the genetics of the two disorders is different. In a similar way to atelosteogenesis type 2 (OMIM 256050) and achondrogenesis type 1B (OMIM 600972), diastrophic dysplasia results from a defect in the sulfate transporter gene DTDST, which encodes a sulfate transporter of the cell membrane (Hastbacka et al. 1994) and is a gene that is not involved in pseudodiastrophic dysplasia (Cetta et al. 1997). The RAPADILINO syndrome (OMIM 266280) is an association of radial aplasia/hypoplasia (RA), patella hypoplasia/aplasia and cleft/high-arched palate (PA), diarrhea and dislocated joints (DI), small size and limb malformations (LI), and long nose and normal intelligence (NO) (Kaariainen et al. 1989; Vargas et al. 1992). Longitudinal radial-ray deficiency (radius and thumb) and patellar aplasia/hypoplasia are the main manifestations of the syndrome. Findings in the face include elongated face, narrow palpe-bral fissures, long slender nose, small chin, and unusual ears. Multiple joint dislocations may occur in association with stiff interphalangeal joints. Multiple joint dislocations (hips, thumbs and great toes) are manifestations of cutis laxa, corneal clouding, and mental retardation (De Barsy syndrome, OMIM 219150), a progeroid disorder with defective development (or synthesis?) of elastic fibers in the skin (de Barsy et al. 1968; Karnes et al. 1992). Affected patients show retarded psychomotor development, hypotonia and athetosis. The corneas are cloudy due to degeneration in the Bowman membrane. The skin is translucent,with unusually obvious superficial blood vessels. A wrinkled face, inguinal hernia, and sclerotic foci in the skeleton are additional findings. Reports of multiple dislocations in association with metaphyseal dysplasia (Phaoke et al. 1993), 'spondylo-acrodysplasia with severe combined immunodeficiency' (Castriota-Scanderbeg et al. 1997), and short stature and carpal coalition (Steel et al. 1993) have recently been reported. Is there jacobsen syndrome gene? Can splints help improve bilateral congenital posterior radial head dislocation? What is joint dislocation syndrome?